Seven acrylic coatings for gelcoat are tested on a severely oxidized hull and rated on application and gloss. NewGlass2 receives Practical Sailors Recommendation and Best Buy honors. "Thank you for this miracle product. My only regret is that now I need to increase the insurance coverage.."
"I purchased NewGlass2 at the Ft Myers Boat Show for my 1990 28' cruiser. After purchasing $180 worth of oxidation remover, special boat wax and a high speed buffer I had no noticeable difference. I then tried your NewGlass2. The results were more than amazing. This 15 year old boat now looks like new, with a high gloss that needs to be seen to be believed." 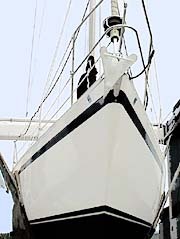 "I got an $8,000 estimate to have Awlgrip professionally applied to my 1977 Seafarer 26 sailboat. Instead, I bought NewGlassII for less than . I still have half a quart left ... it looks fantastic, a real mirror finish ..."
"... it the best stuff we have ever seen to bring back the color and gloss of oxidized gel coat. You actually can see yourself reflected in the surface." "About a year ago we acquired a 1979 Strike '26 which had been sitting in the sun at a dock in Ft. Lauderdale since it was new. We washed the hull down with Soft Scrub and applied the New Glass as instructed. We could see some improvement as the first coat and proceeded with additional applications. It took five coats to get to the gloss level that we felt was acceptable, but this only took about 45 minutes. Of the quart, about half was left when we finished. The hull looks great. People have commented that it looks like a new boat. You actually can see yourself reflected in the surface. ... New Glass certainly will bring back the gloss on a badly oxidized hull. It is very easy to apply and coverage is as good or better than indicated on the container." "... the boat looked better than when it was delivered from the manufacturer." "Three months ago, we applied New Glass to our 1987 Gibson Houseboat which is burgundy and gray. We had tried everything to solve the oxidation and fading problem with absolutely no success. We read about New Glass in your magazine, called the manufacturer, and found them to be very pleasant, courteous, and helpful. We applied New Glass as directed, and, upon completion, the boat looked better than when it was delivered from the manufacturer. To this date, the New Glass has done everything the manufacturer claimed it would, and the boat still looks like new. Our boat is in an open slip on Lake Shelbyville and is exposed to the sun." " ... the boat sits right next to the marina shop and everybody, and I mean everybody, stops to admire the hull shine and asks what product I used." "WOW!!! This NewGlass is really good. I had people coming from across the marina to look at my boat. Great Product." "You can almost use it as a mirror it shines so nice....."
"Thom, If you ever want a testimonial regarding NewGlass2 applied over two-part polyurethane I'm your man.
" ... we absolutely love the look we get with your product." Here's a picture to show you what a 1982 CS36 looks like with NewGlass2 applied. This is our second application in two years and we absolutely love the look we get with your product.